New Music Awards is getting close to announcing this year’s winners for 2019 New Music Awards. NMA once again pays tribute to both major and independent artists/bands for their annual music award event which includes radio stations, programmers, record labels and industry professionals. The process of moving nominees to winners will be open for just a few more weeks allowing for the fans, radio programmers, music industry folks and subscribers to have a helping hand with the NMA winners process. 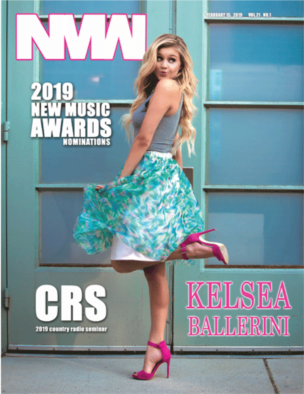 The leading radio publication New Music Weekly will also be setting its sights on an NMA Winners and post CRS edition as well. To participate and be a part of the voting process please visit the NMA website here. Contact New Music Weekly now for advertising offers. Contact us now for available special advertising offers for artists and record labels. New Music Weekly, has graced the pages of Billboard, R&R, Gavin, Friday Morning Quarterback, Music Connection, Inside Connection and most recently Soap Digest. NMW has found great industry success with its airplay charting system which includes the genres of Top40, Adult Contemporary, Country, College, Americana, and Rock radio stations. With the formation of Backstage Entertainment’s cutting edge technology, the Spins Tracking System (STS) has already impacted thousands of radio stations since the beginning of 2005. New Music Weekly has also been honored as “Magazine of the Year” award at the Los Angeles Music Awards. The leading music trade magazine is the #1 chart breaking publication for new music and artists who score top honors during its annual New Music Awards event held in Hollywood, California. The magazine, founded in 1999, boasts over 1500 reporting radio stations in the genres of Top40, Adult Contemporary, Country, College, Jazz and Alternative/Rock. New Music Weekly has also found success with its Future Hits compilation CDs. This multi-format music sampler enables recording artists to get their music in the hands of radio station program directors which support new artists regardless of label affiliation. In addition, New Music Weekly operates the New Music Radio Network which services its syndicated radio specials to thousands of Country and Mainstream radio stations. AirplayAccess.com, is a secure digital music delivery system that allows artists and record labels to get their music to radio programmers worldwide. Trends show that radio programmers are aggressively embracing digital music delivery. Available exclusively to broadcasters around the world, including programmers, DJs, syndicated radio shows, and record pools AirplayAccess.com has partnered with the STS (Spins Tracking System), radio stations interface which utilizes the enhanced security features to protect both radio and the artist. Integrated within STS (Spins Tracking System ) via “hot links” on the current airplay charts, in addition to radio’s music download page, allows for easy and fast features radio programmers have been waiting for. AirplayAccess.com is the music industry’s answer for fast, secure music delivery, enabling registered industry professionals, records labels, artist/bands to get their promotional music directly to radio as broadcast-quality digital files. AirplayAccess is a complimentary, invitation only service to radio from a trusted name in radio airplay tracking…STS. NMW is proud to be the first and only award show not weighted down with the politics and corruption of the corporate world, but an award show showing the true talent which exists in the music industry today. NMW’s motivation for providing the most updated and fairly tracked radio airplay information is owed to the philosophy of radio pioneer and legend Bill Gavin, who started Gavin as a weekly tip-sheet for radio programmers in the 1950s. It wasn’t until the early 1990’s that Gavin’s philosophy was finally archived with the bureaucracy of major label politics. .thus the founding of New Music Weekly magazine.